This comfortable off-the-shoulder gypsy style top features sequins, beads and coins, plus thin metallic elastic straps that hold the top in place. 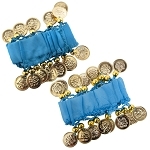 This comfortable off-the-shoulder blue turquoise chiffon gypsy style top features gold sequins, beads and coins, plus thin metallic elastic straps that hold the top in place. The sleeves have a slit down the side which is trimmed with sequins and beads, the top is trimmed along the neckline with sequins, beads, and coins. With elastic openings all around, it is very comfortable and easy to wear for hours. Q: What size does this top fit? I am looking from a 34DD to a 40D ? thank you. Thank you for your question. This top is one size and fits approximately U.S. Women's Standard Sizes XS-L (2-16) Bra sizes 32DDD-38C. MEASUREMENTS- Ribcage: 19 inches unstretched, 38 inches stretched; Chest: 33 inches unstretched, 41 inches stretched. We have updated the description on the product page below the image for any future reference.